Larry Baillie arrived on Bonnaire in 1999. After diving with Bruce Bowker from the Carib Inn he fell in love with Bonaire's east coast and a diving dream was born. A few years later after getting the best boat and equipment, Larry's Wild Side Diving was created. Larry has over 35 years of diving experience with over 9000 dives. He was a military diver for 12 years then a commercial diver for 5. 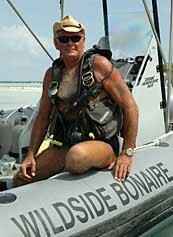 From the west coast of British Columbia, Canada, to the east coast of Bonaire, Larry has been diving in all conditions! When not taking wild side trips, Larry can also be seen at his girlfriend’s art gallery. Janice Huckaby, one of the leading local artists in Bonaire, is the owner of Jan's Art.